Every summer, pets are left in hot cars, with often tragic and heartbreaking results. Unfortunately, many people make excuses to justify leaving their pets without considering the potential harm that could result. We needed to help the Ontario SPCA prevent more of these incidents from happening. No Excuses, No Hot Pets. 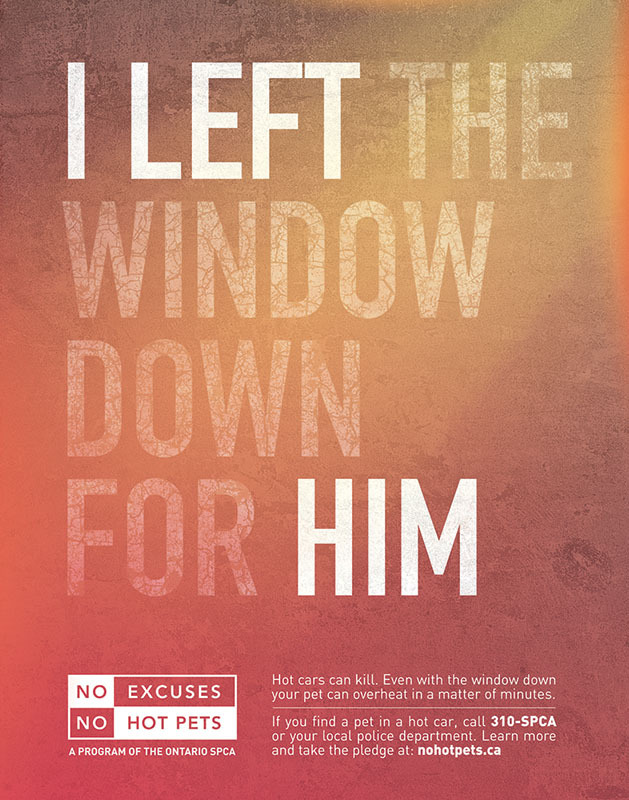 We created a campaign that featured common excuses - with a surprising twist. Using window decals & posters near retail parking lots, we were able to speak directly to pet owners right at the moment when they were about to make the decision to leave their pet in a hot car, revealing the truth behind the excuse. We generated significant social media engagement and created a “No Hot Pets Pledge” where pet owners could sign up to not having an excuse to leave a pet in a car during the hot summer. The result was a spike in pledges on the No Hot Pets website. But the best result of all was the unknown number of animals we saved from unnecessary suffering.